This 15.6-inch widescreen bad-boy maintains Acer's commitment to understated elegance while offering enough chutzpah under the hood to give boy racers nocturnal-emissions. It's not going to win you admiring glances from onlookers because it's far from showy, but it is a well made, solid and dependable budget model with some decent touchscreen software. Our review model incorporates a nice glossy black lid that is a magnet for fingerprints, but that's a small price to pay for such a nice design. The lid is nicely offset by the brushed aluminium surround and touchpad. You aren't going to get actual metal at this price, although we found the plastic to be pretty durable. Fine in fact for taking a few knocks, if you want to carry it around. The Aspire 5745PG feels solid in the hand and has one of the better keyboards you'll use. There's not a lot of space between the flat keys but the board is responsive and we didn't have problems hitting other keys. Acer has even added in a numberic keypad on the right and includes over-sized the important keys. The touchpad is responsive, making navigation a doddle. Screen navigation is equally impressive with the responsive multitouch display pumping out 1366x768 and the glossy coating isn't over-sheened, meaning vibrant colours without glare. It's pleasing to see Acer's comprehensive Touch Portal software bundled. It's one of the better touch software packs out, making it easy to navigate all your films, photos and music. Acer gives a lot of love for a budget model. You get a full-fat 64-bit Window's 7 Home Premium edition, a 320GB hard drive, a slower Core i3 350m 2.26GHz with 4GB and 1GB graphics on the GeForce 310m. That's still more than enough for browsing, streaming and light gaming with stilted delivery. Fortunately the audio is sweet as well with Dolby Home Theater Virtual Surround speakers. We would've like it to go louder, but there's a great tonal range through headphones. There's no Blu-ray, but Acer has bundled four USBs, HDMI and multi-format DVD with, weirdly, no eject hard manual eject button. It might be an issue with our model but it does mean we had to right click on the DVD drive and scroll down to eject. We didn't have any lag problems when we fired up a few apps and browsers, switching without having to wait, making the Aspire 5745PG 354G32Mn much more fun to use than other budget models. Our only annoyance was the average battery life of just under two hours on full wang and this can be increased to 4.5 hours on full use. 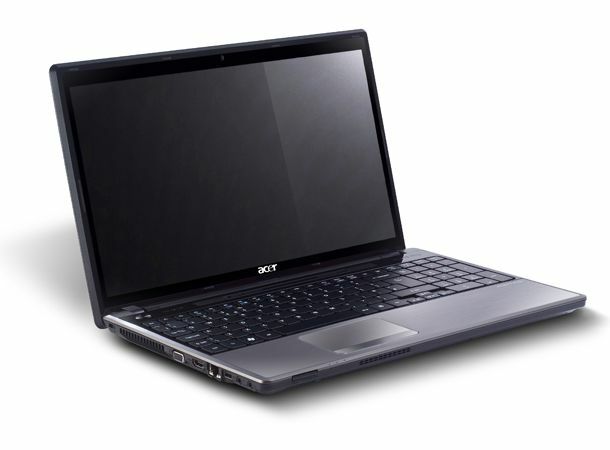 On a bang for your buck ratio, the Acer Aspire 5745PG is hard to top. You can find better specced 15-inch models but not at the bargain price here.